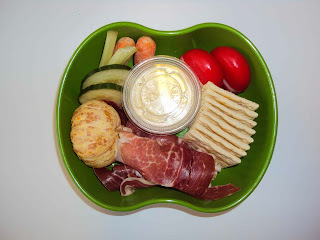 Carrots, Celery and Cucumbers with blue Cheese Dressing, Cheese Wheels, Saltines, Prosciutto and Tangerine. Today's bento box is a little bit of everything. Last week, we were still working on Thanksgiving leftovers and we were getting a little bored with turkey, turkey, turkey. So, I decided to do prosciutto and cheese for Lil' Miss' lunch. Needless to say, my carnivore daughter loved it (not so much on the veggies, though).